Trade shows stands set up in less than 5 minutes without any tools required! Also available in 2.2m x 1.5m and 2.2m x 3m sizes! 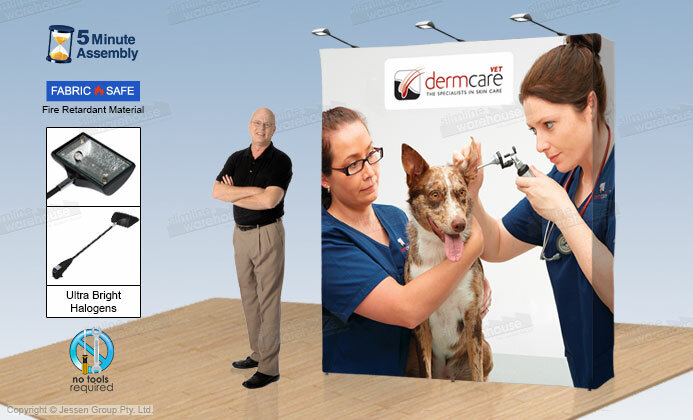 These trade show stands are portable displays, making it easy to bring the units to and from events with the included carrying case holding all the kit components. 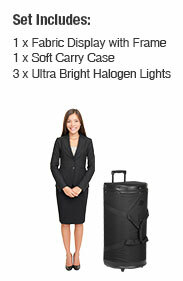 The portable exhibition displays uses a wheeled case to make it easy to place the kit in position whilst you set-up. The pop up display requires no tools for assembly, with the entire set-up taking around 5 minutes to allow employees to focus on other tasks! These trade show stands, like a display for exhibition, display your digitally printed custom designs using a dye-sublimation process that helps show vivid, full colour imagery. 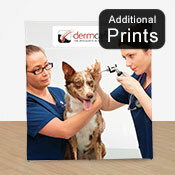 The polyester fabric wrap is made from fire retardant material for safe use. 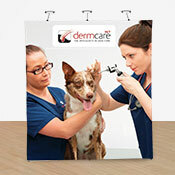 This wrap is also machine washable so that you can have a professional looking display for years to come. The lightweight frame is made from aluminium for durability and stability. Purchase the kit with (3) optional halogen lights that attach to the top of the stand and illuminate graphics, helping draw attention at trade shows, exhibition halls, retail stores, shopping centres, & more! Click here to see our online catalogue, full of hundreds of different products in a large variety of different categories that help you to outfit your business in style! Slimline Warehouse has been providing Australians with high-quality displays at low prices for over 20 years, becoming a national leader in the process. Same day despatch is provided with most in stock products when paid prior to 1pm EST to anywhere in Australia including Melbourne, Sydney, Perth, Brisbane, Gold Coast, Adelaide, & Hobart!